Looking for sprockets? We had a surplus of various steel sprockets and lock collars from McMaster Carr and decided to put them into Grab Bags at a deep discount to clear them out. Perfect for your next big bot! These are not ‘random’ grab bags in that we are guaranteeing that you will receive a specific quantity of each type of sprocket, check out the product page for details. 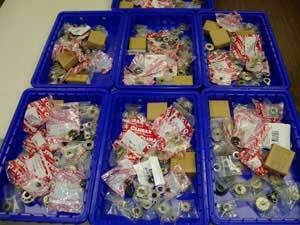 Now aside from the guaranteed sprockets and parts, we’re also throwing in an additional 9-10 random parts as a bonus! These Grab Bags would retail for about $150, and we’re selling them for a third of that. Get ’em while they last! Calling all Tinkerers and Packrats! Random Grab Bags! Editor’s note: Sorry folks, all sold out! Stay tuned for our next Grab Bag and/or limited time special! 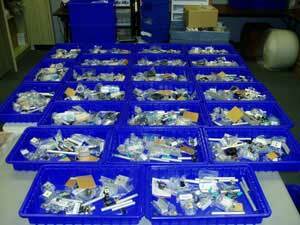 We’re offering a limited time only Grab Bag of random parts, which is sure to make the geek and packrat in all of us cry out in glee. We estimate the retail value on the parts included in this Grab Bag at over $100! We’ve been cleaning house around here, moving out older products bringing in new… and during this spring cleaning we realized we were ending up with a large supply of very cool little gizmos and random parts. Rather than try and sell it piece by piece, we figured it would be fun to divide it all up evenly (based on value) into 30 Random Grab Bags! Now these Grab Bags are a dream come true for tinkerers and experimenters alike. Since these parts were just going to gather dust, we figured we would mark them down to an insanely low price to get rid of them ASAP. We’re going to keep the contents a mystery as that’s half the fun of a Random Grab Gag… but I will say that all of them have at least $20 worth of aluminum parts alone. The last time we did something like this these Grab Bags flew off the shelves, so get them while they last. You don’t find deals like this very often! We only have 30 Grab Bags available and that is it.